Properties: Chlorine has a melting point of -100.98°C, boiling point of -34.6°C, density of 3.214 g/l, specific gravity of 1.56 (-33.6°C), with a valence of 1, 3, 5, or 7. 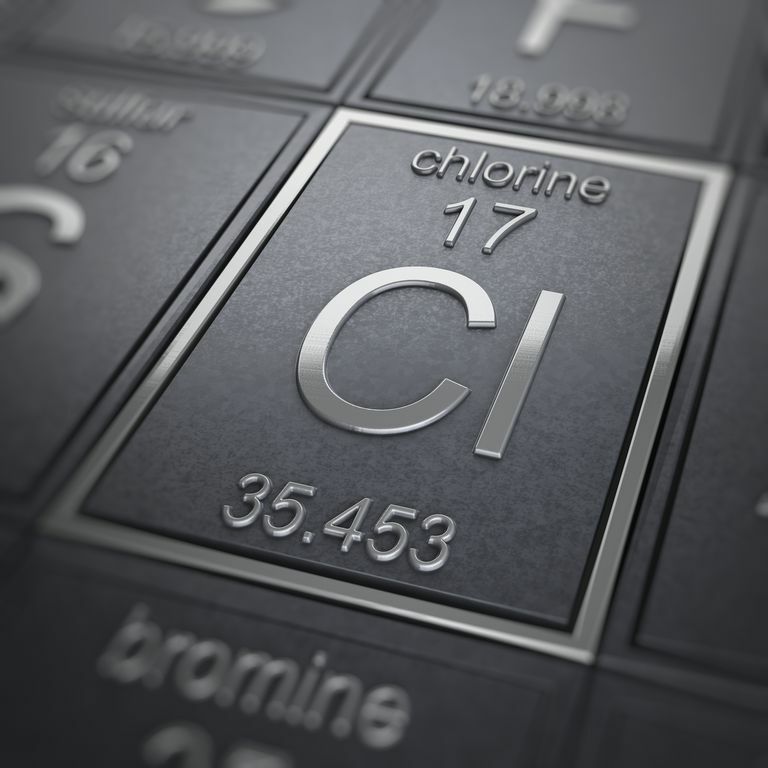 Chlorine is a member of the halogen group of elements and directly combines with almost all of the other elements. Chlorine gas is a greenish yellow. Chlorine figures prominently in many organic chemistry reactions, particularly in substitutions with hydrogen. The gas acts as an irritant for respiratory and other mucous membranes. The liquid form will burn the skin. Humans can smell as low an amount as 3.5 ppm. A few breaths at a concentration of 1000 ppm is usually fatal. Uses: Chlorine is used in many everyday products. It is used for disinfecting drinking water. Chlorine is used in the production of textiles, paper products, dyes, petroleum products, medicines, insecticides, disinfectants, foods, solvents, plastics, paints, and many other products. The element is used to manufacture chlorates, carbon tetrachloride, chloroform, and in the extraction of bromine. Chlorine has been used as a chemical warfare agent. Sources: In nature, chlorine is only found in the combined state, most commonly with sodium as NaCl and in carnallite (KMgCl3•6H2O) and sylvite (KCl). The element is obtained from chlorides by electrolysis or via the action of oxidizing agents. Appearance: greenish-yellow, irritating gas. At high pressure or low temperature: red to clear. Isotopes: 16 known isotopes with atomic masses ranging from 31 to 46 amu. Cl-35 and Cl-37 are both stable isotopes with Cl-35 as the most abundant form (75.8%). Chlorine leaks in containers are detected using ammonia. Ammonia will react with the chlorine and form a white mist above the leak. The most common natural chlorine compound on Earth is sodium chloride or table salt. Chlorine gas was used as a chemical weapon during World War I. Chlorine is heavier than air and would form a deadly layer in low-lying foxholes and trenches.